You will need: Soup ladle, kettle. SCIENCE EXPERIMENTS & AMUSEMENTS FOR CHILDREN BY CHARLES VIVIAN. Simple Technical Steped Practical Projects for school and college students. You will need: Soup ladle, kettle. 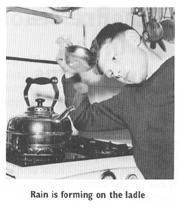 Did you ever realize what a simple matter it is to produce rain in your own kitchen ? Take a kettle of water and bring it to a boil. Once the kettle has been heated sufficiently you will notice vapor coming from the spout, indicating that the water inside is boiling. Often, we mistakenly refer to this as 'steam,' but it cannot be because real steam is invisible. It is, in fact, water vapor and if you study it carefully you will notice that the vapor does not appear to issue directly from the spout. There is a short distance between the end of the spout and the point where the vapor can first be seen. This seemingly 'empty' area is where the actual steam is invisibly leaving the kettle. It quickly cools upon contact with the outside air and becomes the water vapor which we can see. Water vapor is contained in the clouds which produce our rain. The sun evaporates water from the sea, lakes and rivers, and causes clouds to form. When the clouds are sufficiently cooled they become water again and fall back to earth in the shape of rain (or snow). You can turn the water vapor from the boiling kettle back into water, simply by cooling it. Allow a soup ladle to stand in cold water until it is thoroughly chilled. Dry the ladle so that no water remains upon it. Hold the ladle carefully by its handle and arrange the metal bowl of the ladle to come into contact with the stream of water vapor issuing from the kettle. Within a few seconds the vapor will condense on the cold metal and drops of water will fall from the end of the ladle. This is rain.